With summer in full swing in the southern hemisphere and winter ravaging those unlucky ones in the north, it is the ideal time for everyone to sit back, grab a book, and spend some time reading. Not just any book of course. It has to be a cycling book. It doesn’t matter if it is an old classic or a freshly minted new edition, there is nothing better than delving into a world of flashing pedals and whirring spokes. 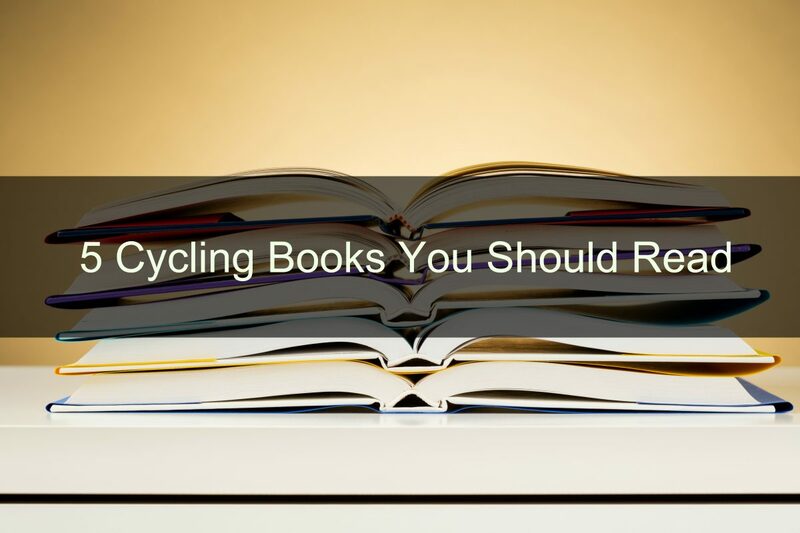 Following is a list of my favourite cycling books. It is not a “best of”, just an outline of the books that I have enjoyed over the past few years. Feel free to add your own selections in the comments section at the end of the article. I’d love to know what you are reading. 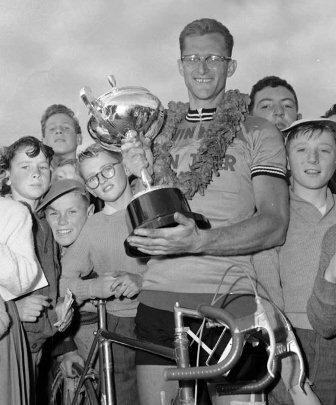 During the 1950s Russell Mockridge was an Australian cycling superstar. Slightly built and bespectacled, he looked too fragile to be a cyclist, but a cyclist he was, and a very good one at that. He shone on the track and was tenacious on the road. He won two gold medals on the velodrome at the Helsinki Olympics and competed in the toughest road races in Europe, including the Tour de France. But this book is so much more than just an account of his many achievements. Mockridge brings to life his early fascination with the bicycle, recalling how he would race his brother from Geelong to Torquay when they were just kids and how he would read about the record breaking feats of Hubert Opperman and then measure out courses of similar distance and see how close he could get to Opperman’s times. His first race for the Geelong cycling club is the stuff of legends, and he recounts it here with good grace and humour. 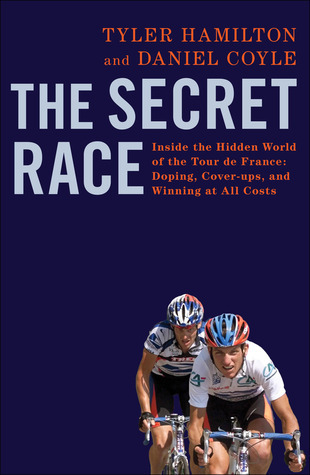 The Man in Front by Russell Mockridge is worth a read for any cycling enthusiast or sports fan. 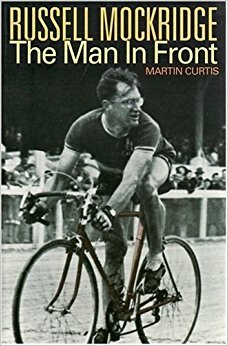 His descriptions of racing in Europe are also told with a wide-eyed boyish feel, and his evocative narration of the brutal ascent of Mont Ventoux during stage 11 of the 1955 Tour de France (a hellishly hot edition) is a particular highlight of the book. Sadly Mockridge didn’t live to see his book go to print. In 1958, just minutes into the Tour of Gippsland, he was hit by a bus at the intersection of Dandenong and Clayton road in Melbourne. He was killed instantly. 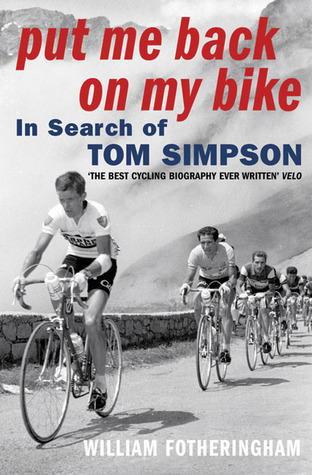 The thing to shine through in this book about British cycling pioneer Tom Simpson, is Fotheringham’s passion for the subject. The author is personally invested in the story and it makes for an engaging read. Through research and interviews, Fotheringham reconstructs the life and career of Simpson. He digs deep, attempting to discover what made the flawed genius tick – both on and off the bike – and he does a fair job of it. His descriptions of how hard it was for non-European cyclists to establish themselves in the closed off world of pro-cycling stand out. Often penniless and without a real place to live, life was tough for those not from the ‘continent’. Simpson (and Mockridge too!) experienced all of it. Simpson died on Mont Ventoux during the 1967 Tour de France. Not surprisingly this fills a large part of the book. Fotheringham covers the incident with compassion, but doesn’t shy away from the fact that drugs and alcohol consumed on the day of the stage contributed significantly to Simpson’s demise. It makes for compelling reading. Gino Bartali was a fascinating character. He was also courageous. And he could ride a bike. He won two Tours de France (one each side of World War II), three Giri d’Italia (victories again split by the war) and four Milano-San Remo classics (the first in 1938 and the last in 1950). There is no doubting that Bartali was a precocious talent on the bicycle – and this book covers all of that – but its primary focus is what happened outside of racing. It outlines how he was manipulated by Italian leaders desperate to maintain their positions during an alarming period of national instability. And it documents the fallout for Bartali when he reached the end of his usefulness to them. The ‘raison d’etre’ for this book though, is Bartali’s war time exploits. Bartali would regularly ride through military check points with messages for the Italian Resistance rolled up and concealed in his bicycle frame. His work for the Resistance was lifesaving, assisting Jewish families and individuals to escape the horrors of Nazism. The book also touches on his rivalry with Fausto Coppi. While the authors are obviously in awe of Bartoli and are happy to perpetuate the myths surrounding his life, this is still a good book. If you look past the hero worship, enough remains to get an accurate picture of Bartali and the tumultuous time he lived in. This book is short, fast and fun. I’ve read it multiple times and it never gets old. 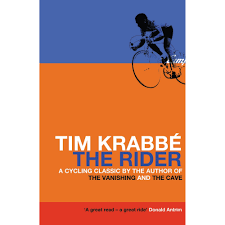 Written by Dutch author Tim Krabbe, it is a semi-fictional account of a 150 kilometre amateur road race. Scripted from the point of view of one of the riders, the book gets inside the head of the cyclist, with all his thoughts, hopes and fears laid bare for the reader. 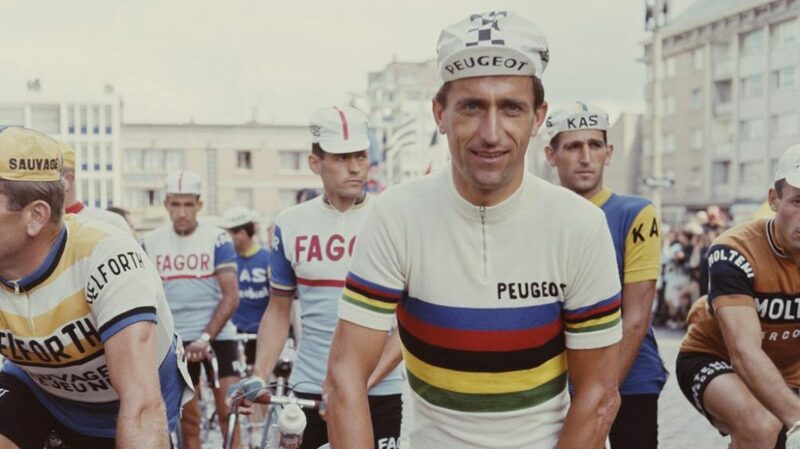 It also delves into cycling folklore with its quirky anecdotes and observations; my favourite being the story of how Jacques Anquetil, when approaching a climb, would make his bike lighter by removing the bidon from its cage and placing it in his jersey pocket! This book is full of such gems. But at its heart is a blow by blow description of the race, a kilometre by kilometre account of what goes on in a cyclist’s mind as the countryside rolls by. The pain, the exhilaration, the fear, the frustration, the anger, the pleasure – it is all there. Best read in one sitting, The Rider is a cycling book with a difference. It is not about a pro-cyclist or a superstar from the past. It is about us! Anyone of us could be the protagonist in this book. I didn’t want to buy this book. I had no interest in reading about doping or dopers. I was fed up with them all! But it sat in the window of the book shop for a week, a clearance special that called to me like a siren. Eventually I relented and parted with $5.00. When the shopkeeper handed me the book, I felt like asking for a brown paper bag to carry it in. But what a read it turned out to be. So much so that I wrote an article about the experience! Tyler Hamilton is an interesting character and one who knows how to suffer. He rode the entire 2003 Tour de France with a broken collarbone, won a stage and finished fourth overall. Unfortunately he will not be remembered for his ability to absorb pain. Instead he will be remembered as a serial doper, a rider who, after serving an initial suspension of two years, came back and doped again, this time being banished from the sport for a career ending eight years. The sad part of this book is that Hamilton comes across as being such a nice bloke, a genuine character who you’d be happy to spend time hanging out with. His explanations for falling into doping are told sincerely and you actually start feeling sorry for him, especially when Armstrong turns on him. But then he dopes again and any sympathetic feelings you may have felt evaporate pretty quickly. This book offers a fascinating behind the scenes look at what went on in cycling teams during the Armstrong era. Hamilton’s recollections of his dealings with Armstrong make for especially interesting reading. I love everything about this book. Everything! From its evocative title to its emotional final pages, it remains engaging throughout. Jean Bobet is the brother of three time Tour de France champion Louison Bobet, and although this is an autobiography of sorts, tales of Louison are intertwined throughout the narrative. In fact they are vital to it! What we get is an intimate look inside a cycling family. You see, Jean was also a noted pro-cyclist and he raced with Louison many times throughout the 1950s, including the brutal 1955 edition of the Tour. Bobet’s brilliant description of that edition’s climb of Mont Ventoux under horrendously hot conditions has the reader gasping for breath and tasting the dust along with the riders. Russell Mockridge wrote about the very same day in his book, ‘My World on Wheels’ and it is interesting to compare the two pieces of writing. They compliment each other brilliantly. Bobet also writes about doping, giving us an inside look at the attitudes towards performance enhancement in the 1950s. The book concludes with an emotional account of Louison Bobet’s fight against cancer, a fight that the former champion could not win. That it is told through the eyes of a loving brother adds a powerful element to the writing. And the story behind the title? I’ll leave that to Jean to explain. 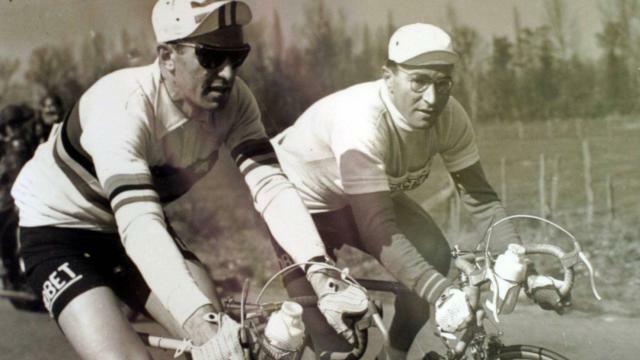 Louison and Jean Bobet doing what they loved the most. Of course, there are also plenty of cycling magazines available for those of us who just can’t stop reading about cycling. I love this magazine. I only started buying it when Australia’s own ‘Ride Cycling Review’ ceased publication. Rouleur’s primary focus is road cycling and its thoughtful articles, wonderful photography and quality writing make it the best of its kind. I wish I had sampled it earlier. Each edition is beautifully presented and is pretty much a collector’s item. Definitely not to be thrown away after being read! Conquista started with online editions only, but now has print copies available as well. The photography is stunning, with articles written by a mix of professional and amateur writers. The focus is broad, and fringe elements of cycling are given just as must space as the pros. If you are interested in events such as the Red Hook crits for instance, then this is the magazine for you. Now it’s your turn. Tell me, what are you reading? Are you itching to go for a ride after reading this article? Check out the Bike Chaser Marketplace for bicycles and accessories for sale that can make your next ride even better.